Why should I climb Denali with IMG Denali? The advantages of our program are extensive. 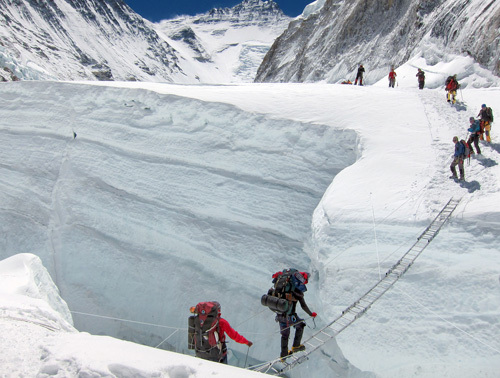 We personally select the group of 8 climbers based on their resumes and past experiences. Our group is small, manageable and structured at a 2:1 client to guide ratio. The expedition leaders are chosen for their past experience, but that is just one part of the equation. These guides have a wealth of climbing knowledge based on years of climbing experience. Our goal is to have a fun trip, make the summit if we can safely do so, and return back home again at the end of the expedition. To that end, we screen our prospective team members and invest in the guides and equipment to make this a reality. 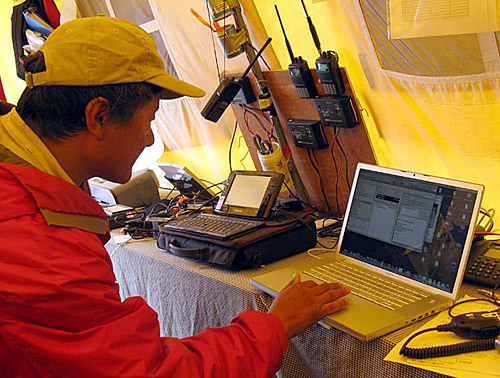 What are the requirements for participation in an IMG Denali expedition? 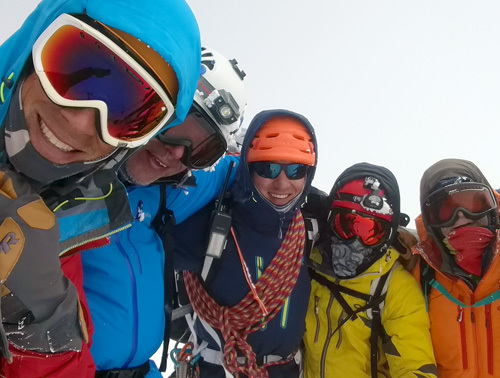 These programs are geared towards climbers interested in a Denali expedition and include training in snow camping, cold weather techniques, avalanche fundamentals, glacier travel, crevasse rescue, sled pulling, fixed ropes, etc. 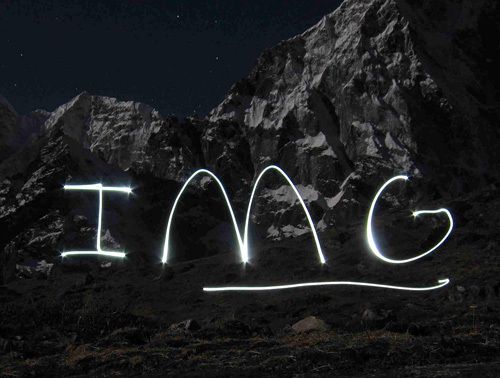 IMG recommended option: 6.5 Day Denali Seminar on Mt. Rainier. Additional experience abroad and on other peaks in Alaska will only add to your readiness for Denali. IMG examples: Mexican Volcanoes, Alaskan Ascents, South America (Bolivia, Aconcagua, Ecuador and Peru), Mt. Elbrus, and Lobuche. Get out and do some overnight and multi-night trips carrying a backpack and camping in tents. The experience will help you to become more self-sufficient on bigger expeditions. Practice A LOT carrying a heavier backpack (60+ pounds). Go on snowshoe hikes, ski, backpack in winter and camp overnight in cold weather. Again, the experience will help you to become more self-sufficient in cold weather conditions. Use your cold weather gear and become familiar with it. 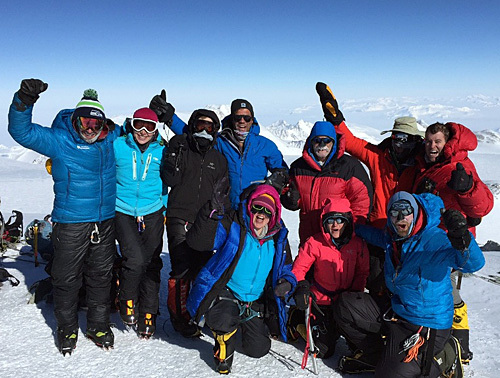 See the Training Section below for more detail, but we recommend starting with a Denali-specific training program six months to a year prior to your expedition date. Keep a good base level of training going and work up to 3-4 days a week with up to an hour of varied cardio training per session. Slowly add more and more hill work with heavier and heavier weight on your back. Work on slow, steady improvement and try to avoid overuse or stress injuries. Get out and do some longer trail sessions on the weekends whenever you can. Get outdoors in all conditions! In addition, we recommend weight training with emphasis on core, back, arms, legs (e.g., the muscles used for lifting heavy packs, pulling on fixed ropes, snowshoeing uphill while wearing a heavy backpack (60+ pounds) while also pulling a heavy sled (60+ pounds). How do I train for a Denali Expedition? The best training for the mountains is in the mountains. Unfortunately, most people who work a regular work week are limited to evenings, weekends and vacations for exercise. For this reason it is imperative that your training periods be focused, simulating as closely as possible the mountain environment. Run hills, trying to avoid flat asphalt. If no hills are available nearby, get creative. Run stadium stairs or high-rise fire escapes. Whenever possible, get in longer, slower sessions, an hour or more. If you train in the city, get permission to hike up the stairwell of the highest building around. Wear a pack. Time yourself and do as many flights of stairs as possible in an hour's time. Take the elevator down to save your knees. Don't lock yourself into one type of exercise exclusively. Stairmaster devices are a good example. They are easy to cheat on and too specific a motion. Get out on trails, even if it is only on the weekends. For the six to twelve months prior to your expedition, you will need to be a bit selfish. You must commit to a regular training schedule and increase your efforts gradually, with the goal of peaking just prior to the start of the trip. Keep a training calendar and record your efforts each day. This is a good way to keep yourself honest and to measure your progress week to week. Don't overdo it at the start. You will lose more if you become injured and have to lay off for several weeks. Start off moderately and build up your training gradually. Do not start a new exercise program without first consulting your doctor. Learn to make the most of your regular training workouts. You must exercise for an hour to an hour and a half at least three times a week, and preferably more. When running, increase your mileage gradually, working up to at least six miles a session on the hilliest terrain available. Work on your speed until you can run hills at a sub-eight minute pace. Keep your training fun and varied. Bike, swim, play basketball or racquet sports. When confined to the gym, fit in several 20 plus minute sessions on the exercise bike, Stairmaster, etc. in between your weight training to keep it as aerobic as possible. Definitely exercise your back, shoulders, chest and arms, but focus on your legs. Get some advice from a trainer or physical therapist and work on exercises to strengthen your quads without injury to your knees. Stronger quads will help to support your knees better in other types of training such as running. Work on your hamstrings and calves too. With any weight training I would recommend working up to 3 sets of 12 or more repetitions. Move up in weight only when you can do 3 full sets in good form. Hike up hills with a pack whenever possible. Start with 30 pounds and work up to 50 plus. Don't try to run, but do stride. Use ski poles to involve the arms for a more complete workout. Pack your pack with a sleeping bag or some type of filler, then put the heavier weights (like full water bottles) close to your upper back. Take it easy on the downhill. Lighten the load if possible. Whenever the opportunity arises, camp out in cold weather. Practice with your gear combinations. Figure out how your clothing combinations work together and how to use them to regulate your body temperature as you hike. Practice things like adding pile pants underneath your Gore-Tex pants, while wearing gloves. One hint is to add zipper pulls to all of your zippers. Train in your plastic boots whenever possible and if you have access to snow and snowshoes, train with snowshoes on as well. Learn how to pace yourself over a long day of hiking and start to figure out what your food and water requirements are for a stressful day in the mountains. Learn how your gear works and learn how your body works. The closer we get to departure date, the more important it is to get out on long, slow distance training sessions with lots of hills. However, don't try to cram all of your training into the last two weeks. Ease off a little, and relax. It is important to arrive at the mountain rested and healthy. Avoid exposure to colds and illness if at all possible. A great way to start the climb exhausted and run down physically is to try to do too much last minute business in the days immediately prior to departure. Wind business down early and spend some time with your family and friends. Your body will thank you and so will your teammates. How should I pack for a Denali Expedition? Take a close look at the Denali Gear List and consider each item carefully to be sure you understand the function of each piece of equipment before you substitute or delete items. Keep in mind that this list has been compiled by the expedition organizer. Don't cut corners on the quality of your gear. Acquire all of your equipment well in advance. Pack up your pack completely and weigh it. If it weighs more than 50 lbs. complete, go back through all of your equipment with a fine-toothed comb. Start by eliminating unnecessary luxuries. Bring a compact camera instead of a bulky SLR. Weigh your personal food and eliminate anything over 15 lbs. Check over your clothing for redundancy. You will probably want to bring two lightweight tops, one to change halfway through the trip, but nothing extra. Eliminate gizmos that you threw in just because you thought they might be useful. We don't all need Leatherman tools, extensive repair kits and group sized first aid kits. Just bring the items you are likely to need yourself: a small pocket knife, a compact F.A. kit with blister treatment, a roll of tape and non-prescription painkillers that you normally use. There will be a group repair kit, tools and first aid kit. Don't bring any extra toiletries other than toilet paper, toothbrush and a small tube of toothpaste. One exception: baby wipes can really increase morale throughout the trip and are worth the extra weight. Pack and repack your gear several times and have a place for everything. Keep your stuff sacks to a minimum and buy them in different colors so that you can easily identify the right bag in your pack. Hint: black is not easy to identify in the depths of your pack. One large sack is recommended for all clothing, one smaller bag for gloves and hats, and one medium bag for food. Keep it simple. Go out on a number of training hikes with your full pack so that you become familiar with the heavy load and retrieving articles from it efficiently. Keep in mind that in addition to your personal gear, you will be issued about 50 lbs. of group gear at the start. It will come in all shapes and sizes, so you must be prepared to fit it in your pack and sled. There are three items that you must not skimp on: your climbing boots, your sleeping bag and your down parka. These will get you up and down the mountain safely. The best boots are the ones that fit your feet the best. Try on as many different brands as possible. Often you can upgrade your old boot by purchasing a new liner. The best on the market right now are the appropriately named Intuition Denali. This liner can be heat molded to your foot and is quite comfortable and very warm. Feet tend to swell at higher altitudes so bumping your boot fit up a half is a good idea. When in doubt between sizes, get the bigger one! Only you can judge how warmly you sleep at night. Bring a sleeping bag that will guarantee you a warm night's sleep. Some climbers like to use a wide cut bag so there is room to fit your inner boots, water bottles, etc. inside as well as your down parka if it really gets cold. A waterproof/breathable fabric covered down bag is the standard for expeditions and is the warmest and lightest way to go. Be wary of temperature ratings on bags. There is no industry standard at this time. The only true test is your own past experience. Many people do nicely in a -20°F bag, but if you are in doubt, go for the warmest bag available. -40°F is a bag that will keep you warm all the way up the mountain. Your down parka will be your best friend in camp. We don't usually climb in them, but when the temperature cools in the evening, it is the first thing to go on. At cold rest breaks during the climb you will want to throw it on to trap body heat and avoid chilling. For that reason, size your parka large enough to fit over all other layers that you might be wearing, including your outer shell. Finally, the best parkas come with attached hoods, not snap-on or zippered. Acquire your equipment well in advance. Practice with it and use it out in the mountains. Train seriously for the expedition so that when you arrive at the start of the climb, you will be confident that you have done everything possible to prepare yourself mentally and physically. 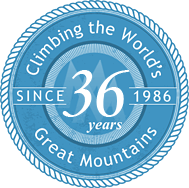 All that will remain is for you to enjoy yourself fully on one of the world's greatest climbs! What should I pack for lunch food? For lunches on the mountain, consider including items such as energy bars, gorp, candy, cheeses, sausage, jerky, bagels, crackers, drink mix, etc. About 15 lbs. total for two weeks is normal. Variety is the key. This will be used as climbing snacks during the day and at night in the tent. Here are a few tips from IMG guides on what foods work well in the mountains. 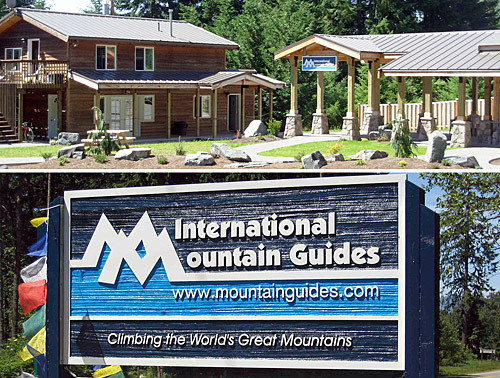 International Mountain Guides has worked for many years with Ms. Pirjo Dehart and her staff at CTT Destinations to provide professional travel service for participants in our programs. We urge you to contact CTT Destinations at 800-909-6647 or img@cttdestinations.com for help with your plans. IMG Denali climbers are REQUIRED to carry approved travel insurance that covers technical, high-altitude mountaineering and includes medical evacuation, repatriation and medical expenses for the duration of their IMG Denali program and understand that IMG Denali provides them with no such insurance coverage. We recommend several plan options that are listed on our Trip Cancellation and Travel Insurance page. We strongly recommend Trip Cancellation Insurance which may provide financial relief should you be forced to withdraw from the program before it starts. NPS Climbing Permit Fee of $375 ($275 for anyone 24 and younger). NPS Park Entrance Fee $15/person (16 yrs and up).